Possibly the last photograph  and the only color photo we've seen, other than colorized postcards  of Sandberg's Summit Hotel, which burned down in 1961. This photograph was shot in the summer of 1960 (developed August 1960) by contributor Michael Sullivan, then of Hollywood and now (2012) of Utah. "I had a fascination with the Ridge Route and had made a trip in my 1959 Ford, taking several photos," Sullivan writes. "I wish I had taken more. I followed the road from Castaic to Gorman and happened upon the Sandberg building. I did not think much of it at the time, so I only took the one photo. It was occupied as there is a car in the parking lot and smoke was coming from a chimney. I don't think it was for warmth in August, so maybe trash burning." Ominous. In 1961, owner "Lucky" Walter Stevens was burning trash in the fireplace when the building went up in flames. This is a side view; the three-story tower is partially obscured by the trees at left. According to Ridge Route historian Harrison Scott, Norwegian-born Harald Sandberg erected a one-story hotel in 1914 in anticipation of the 1915 opening of the Ridge Route highway. In 1918 he was appointed postmaster and the area was officially named Sandberg. Harald (b. 9-4-1867, d. 7-9-1939) expanded the hotel sometime after 1921, turning it into a high-class, three-story log hostelry using timber he cut down on the property. The ground floor featured the post office, lobby, dining room, ladies' lounge and men's lounge. The family lived on the second floor; guest rooms were on the third floor. 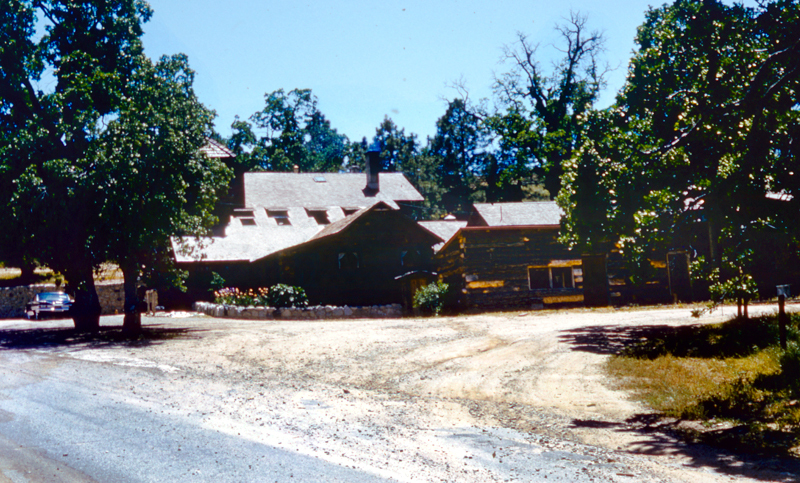 Several cabins were added behind the hotel, along with a garage that had upstairs guest rooms. Sandberg's Summit Hotel made news in September 1929 when Ulysses S. Grant Jr., the 77-year-old son of the former president and an avid motoring enthusiast, was found dead in bed there, presumably from a heart attack. The hotel changed hands a few times around the time of Harald Sandberg's death 10 years later. Its vaunted reputation shattered under the ownership of J.H. Cox, who reputedly brought in "booze, slot machines and ladies of the night," according to Scott, who carefully notes that Harald Sandberg had repeatedly rebuffed pressures from "various syndicates" to allow gambling during his lifetime. "We will probably never know for sure if Mr. Cox profited from any alleged shady activities at the hotel," Scott writes, "but we do know that he was doing pretty well selling apples from the old Sandberg orchard"  an unusual crop for the region. Cox ultimately sold to a German woman, Lillian Grojean, an ex-con who manufactured ceramic tableware sold in department stores and who, according to local legend, transmitted secrets to the German government during World War II. The allegation has never been proved, and what secrets a potter in the boonies might know has never been explained. Around 1950, Grojean sold the hotel to a fellow ceramics maker from Burbank, "Lucky" Walter Stevens, who was in the process of rehabilitating the property as a camp for underprivileged children when sparks from the fireplace in the lobby ignited the wood-shingled roof. Stevens had been burning trash. The date was April 29, 1961. Two cabins survived the fire. 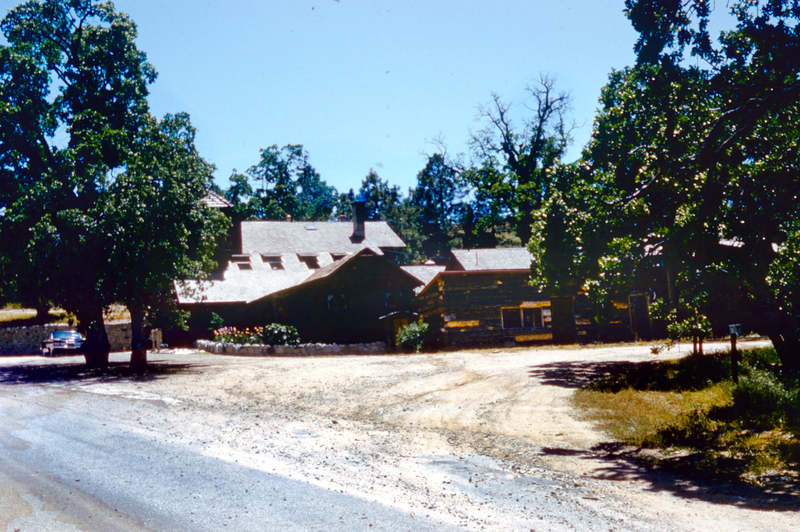 The Forest Service canceled the lease on the property in 1963. One cabin was moved to a nearby ranch and the fate of the other is unknown. For more information, read "Lost Hotels on Caliornia's Historic Ridge Route" by Harrison Irving Scott (2008).